What may have been Saskatchewan's snowiest winter ever is now being followed by the coldest spring in more than a century. 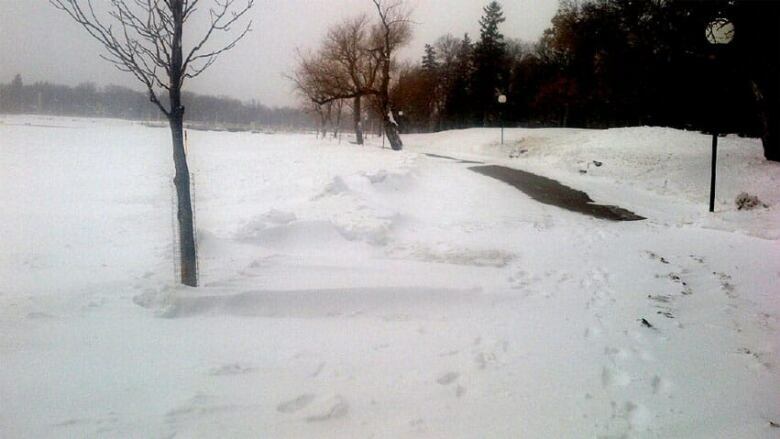 What may have been Saskatchewan's snowiest winter ever is being followed now by the coldest spring in more than a century. On Monday morning, cold weather records for the day were broken in at least 12 communities, according to Environment Canada. Among the colder communities was Weyburn, where it dipped to –13.6 C, shattering the old record for April 22 of –7.2. Regina dipped below -10 Monday morning and crept up to 0 C later in the day. That compares with a high of about 21 a year earlier. The temperature dropped to – 15 C overnight. For Tuesday, Environment Canada forecast a high of 3 C in Regina, compared with a normal of 15 C.
It's been the coldest March and April in 113 years, according to Environment Canada's senior climatologist David Phillips. "You have to go back to the early 1900s to find a temperature that was as cold on this morning in both Regina and Saskatoon and I'm sure in many other parts of the province," he said. A lack of warm air coming up from the U.S. this spring is part of the trouble, Phillips said. Another problem is the extensive snow cover, which is reflecting a lot more sunlight than usual. That's been keeping the ground from warming up. Ten days from now, he says, Saskatchewan may start to see the temperatures inch up toward more seasonal values. In fact, May and June should be warmer than normal, Phillips said.